An Albatross rests peacefully on the surface of the water as a dolphin watching tour with Encounter Kaikoura on the South Island of New Zealand passes by. Passengers aboard a dolphin watching tour with Encounter Kaikoura in New Zealand were lucky enough to spot an Albatross resting on the surface of the water. Its black wings are tucked away on its backside as the pure white snow colored head looks around the region with its feet paddling slowly beneath the surface. 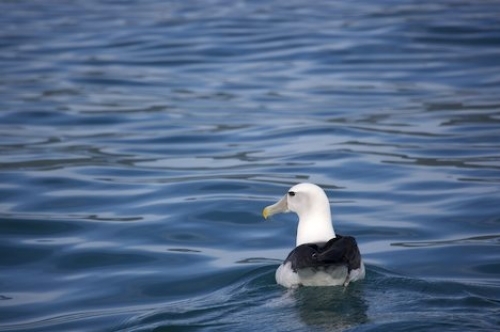 The Albatross can be found close to the shore at Kaikoura along with many other types of seabirds. The dolphin watching tour with Encounter Kaikoura leaves several times during the day and each tour passes by the seabird watching area. The Albatross is one of the world's largest flight birds and it is amazing to see one soar above in the blue sky off Kaikoura, New Zeland with its large wing span. It is not unlikely to have an extremely close encounter with the Albatross when aboard Encounter Kaikoura. The Albatross is not the only beautiful animal you will see while on a tour with Encounter Kaikoura, be on the lookout for the Dusky Dolphins and the Sperm Whales. During the summer months, the dolphins will spend a lot of time inshore which makes spotting them leaping about much easier. Sperm whales are also regularly seen during the summer off the Kaikoura coast on the South Island of New Zealand.